Former U.S. Secretary of State John Kerry says he's ashamed that U.S. Vice President Mike Pence didn't mention climate change at an international security conference and is vowing to help make it a voting issue. He said: "I'm ashamed that our vice president of the United States stood up here at a security conference and never even mentioned the word 'climate change.'" Kerry added: "I wish there was a way to hold the president of the United States accountable for the loss of life that is going to take place every day, for the displacement of people, for the trillions of dollars we will have to wind up spending because we're not getting the job done." Russian Foreign Minister Sergey Lavrov has fired back at British Defense Minister Gavin Williamson, calling him the "minister of war." Lavrov's comments Saturday came the day after Williamson gave a speech at the Munich Security Conference saying that Russia was "trying to goad the West into a new arms race it simply is not interested in and does not want." Lavrov, talking about Russia's perception of "increased activity by NATO," said Moscow was interested in knowing how the western alliance saw its mandate in the Arctic. He says "if you listen to some people like minister of war — or, sorry, minister of defense of the United Kingdom, then you might get an impression that nobody except NATO has the right to be anywhere other than in their own borders." The presidents of Serbia and Kosovo have traded barbs at an international security conference over the responsibility for a stalemate in efforts to improve their ties. Kosovo, which broke away from Serbia in 2008, last year set a 100 percent import tariff on Serbian goods until Belgrade recognizes its sovereignty and stops preventing it from joining international organizations. A European Union-facilitated dialogue has stalled, with Belgrade saying it won't participate until the tariff is lifted. Serbian President Aleksandar Vucic and Kosovo President Hashim Thaci appeared together at the Munich Security Conference on Saturday, both expressing interest in reaching an agreement but neither appearing to give ground. The EU's enlargement commissioner, Johannes Hahn, urged them to move toward a compromise. He said it's time, "even if it doesn't sound and look like a window of opportunity, to strike very soon a deal." A top Chinese official is defending Huawei, dismissing American concerns that the telecom giant might covertly collect data and report it to Beijing, and urging Europeans to ignore Washington. Yang Jiechi's comments Saturday came after U.S. Vice President Mike Pence labeled Huawei a "threat" to national security systems and urged allies to exclude them from developing 5G wireless infrastructure. Yang told the Munich Security Conference Europeans "know where their own interests lie, so let there be fewer lectures," accusing the U.S. of pushing its own self interests. He says "Chinese law does not require companies to install back doors or collect intelligence" and said Huawei "as a company is cooperating very closely with the European countries." He says "the Europeans know very well what is the wise path for them to go forward." — This item corrects Pence's title. A senior Chinese official is signaling that Beijing isn't interested in joining an expanded version of the Cold War-era nuclear weapons treaty between the United States and Russia that Washington and Moscow have decided to abandon. The U.S. announced this month that it was pulling out of the 1987 Intermediate-Range Nuclear Forces treaty because of Russian violations. Moscow followed suit, strongly denying any breaches. The U.S. administration also has worried that the pact was an obstacle to efforts to counter intermediate-range missiles deployed by China, which is not covered by the treaty. Politburo member Yang Jiechi told the Munich Security Conference Saturday that the INF treaty should be preserved but "China develops its capabilities strictly according to its defensive needs and doesn't pose a threat to anybody else. So we are opposed to the multilateralization of (the) INF." U.S. Vice President Mike Pence is urging allies to take seriously "the threat" posed by Chinese telecom giant Huawei as they look for partners to build 5G wireless infrastructure. Pence said Saturday the U.S. had been "clear with our security partners on the threat posed by Huawei and other Chinese telecom companies." He told the Munich Security Conference they "provide Beijing's vast security apparatus with access to any data that touches their network or equipment (and) we must protect our critical telecom infrastructure." He says "America is calling on all our security partners to be vigilant and to reject any enterprise that would compromise the integrity of our communications technology or our national security systems." China rejects the U.S. position, saying Washington has provided no evidence Huawei threatens national security. U.S. Vice President Mike Pence is doubling down on his criticism of European nations working to preserve a nuclear deal with Iran, saying they should follow Washington's lead and withdraw from the agreement. 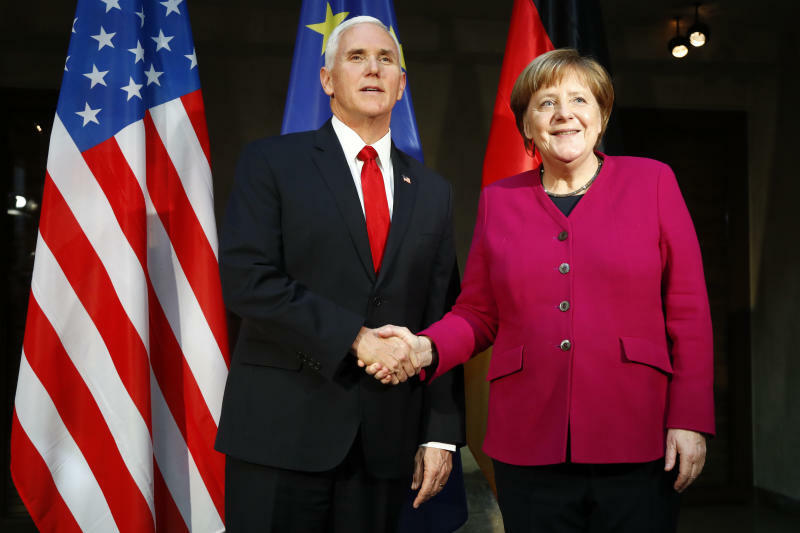 Speaking Saturday right after Chancellor Angela Merkel defended the 2015 Iran deal, Pence said "the time has come for our European partners to stop undermining sanctions" by continuing to offer economic incentives in exchange for Tehran limiting its nuclear capability. He says Europe should withdraw from the Iran nuclear deal "and join us as we bring the economic and diplomatic pressure necessary to give the Iranian people, the region and the world the peace, security and freedom they deserve." France, Germany and Britain, as well as the European Union, Russia and China, have been struggling to preserve the deal since the U.S. pulled out last year. German Chancellor Angela Merkel says U.S. authorities appear to have concluded that European cars are a threat to national security. Merkel said at the Munich Security Conference that Germany is "proud of our cars, and we're allowed to be," and many of them are built in the U.S. The European Union and the U.S. have been trying to ratchet down trade tensions in recent months and Merkel says she has "great hope" in the negotiations. But she added: "It is not entirely easy for me as German chancellor to read that apparently — I don't have it in writing yet — the American Commerce Department says German, European cars are a threat to national security." She noted that German automaker BMW's biggest plant is in South Carolina "and if these cars ... are suddenly a threat to the United States' national security, that startles us."